You have probably seen those open transport carriers on the road that have a multi-hauler structure with double- or triple-levels, allowing vehicles to be stacked for transport. This is the most common way to transport vehicles, often seen with new cars going from the manufacturer to dealerships. Open carrier auto shipping is common because it is efficient and our most economical form of auto shipping. 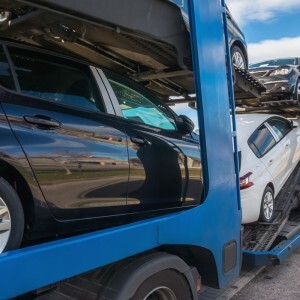 With open carrier shipping you share the costs with other transport customers, making it less expensive than moving an individual car or by driving it yourself. Auto Shipping Group offers safe, efficient open carrier shipping for cars, trucks, SUVs, fleet vehicles, and motorcycles. We offer door-to-door delivery that you can rely on. Our deliveries fully insured for your peace of mind. Open carrier auto shipping is so in demand that there is never a wait for the next transport headed to the destination you need. If you are shipping more than one automobile, you will save by shipping them on the same open carrier. Get your vehicles where you want them, all delivered at the same time, on time! Contact us today for trusted open carrier shipping. Auto Shipping Group is the only call you need to make: (360) 207-5480.